Objective: The study aims to explore the clinical effect of open reduction surgery for anterior dislocation of the shoulder combined with surgical neck fracture of humerus of badminton athletes. Methods: Clinical data of 2000 patients with anterior dislocation of the shoulder combined with surgical neck fracture of humerus admitted in our hospital from June 2012 to June 2014 were analyzed retrospectively. All the patients were badminton athletes. Our clinical staff adopted open reduction surgery for the 2000 patients with anterior dislocation of the shoulder combined with surgical neck fracture of humerus. The patients’ treatment method, recovery and treatment effect were analyzed to sum up the clinical treatment experience. Results: All the 2000 patients included in the clinical study were treated with open reduction surgery. All the operations were successful. The healing time of the fracture end was 6 weeks to 10 weeks, with average healing time at (8.04 ± 0.15) weeks. The patients were followed up for two years after the operation. 1700 cases have excellent shoulder joint function recovery, 250 cases have good recovery, while the remaining 50 cases have poor recovery, with excellent rate at 97.50%. Conclusion: Open reduction surgery enjoys very significant curative effect in treatment of anterior dislocation of the shoulder combined with surgical neck fracture of humerus. After the surgery, the patients had good shoulder recovery, with low probability of complications. Thus, this surgical method can serve as the preferred treatment method for treatment of anterior shoulder dislocation combined with surgical neck fracture of humerus. Anterior shoulder dislocation combined with surgical neck fracture of humerus, Open reduction, Curative effect. Anterior dislocation of the shoulder combined with surgical neck fracture of humerus (Figure 1) is a very serious shoulder injury. This injury is more common in car accident patients, and the number of patients shows a very obvious upward trend year by year. The treatment of proximal humeral fracture is challenging owing to the variable deforming forces of the muscles surrounding the fractured bone and operative treatment with plate and screw fixation through a deltopectoral approach is the commonly used [1,2]. Proximal humeral fractures account for about 5% of all fractures . Patients with proximal humeral fractures are more common in the elderly over 60 years of age, and the number of elderly patients is increasing . Neer typing  and AO  typing are the most common clinical types. Open reduction and locking plate fixation is the most commonly used method for the treatment of proximal humeral fractures. Rueh et al. showed that the locking plate could stabilize the proximal humerus fracture block stably through biomechanical tests. 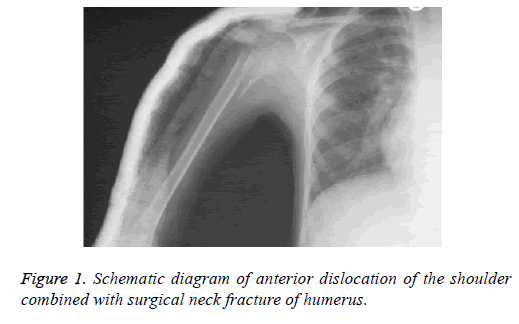 Figure 1: Schematic diagram of anterior dislocation of the shoulder combined with surgical neck fracture of humerus. Due to occupational characteristics and sports characteristics and other factors, incidence of anterior dislocation of the shoulder combined with surgical neck fracture of humerus among badminton athletes is significantly higher than the normal population. The disease is a very serious injury for badminton athletes. If not handled properly, it is likely to affect training result of badminton athletes, and even concern their entire career . Clinical study found that anterior dislocation of the shoulder and surgical neck fracture of humerus can affect each other. Thus, clinical treatment is difficult. At this stage, clinical treatment methods for anterior dislocation of the shoulder combined with surgical neck fracture of humerus mainly include manipulative reduction, closed reduction, external fixation and open reduction . Among them, open reduction surgery is the most commonly used in clinical treatment of anterior dislocation of the shoulder combined with surgical neck fracture of humerus. The purpose of this study was to investigate the clinical comes of open reduction surgery for anterior shoulder dislocation combined with fracture of surgical neck of humerus. In order to prove clinical treatment effect of this method, the 2000 patients with anterior dislocation of the shoulder combined with surgical neck fracture of humerus admitted in our hospital from June 2012 to June 2014 were selected as the research objects, with following analysis of treatment method, treatment effect and rehabilitation done. The information and results are hereby reported below. Clinical data of 2000 patients with anterior dislocation of the shoulder combined with surgical neck fracture of humerus admitted in our hospital from June 2012 to June 2014 were analyzed retrospectively. All the patients were badminton athletes. Our clinical staff adopted open reduction surgery for the 2000 patients with anterior dislocation of the shoulder combined with surgical neck fracture of humerus. Among the 2000 patients included in this clinical analysis, there were 1100 male patients, 900 female patients; the patients were aged 18 to 37 years, with average age at (28.23 ± 4.31) years. The main clinical symptoms of the patients were varying degrees of pain, swelling of the shoulder, shoulder dysfunction. Before undergoing open reduction surgery, all the patients received magnetic resonance test . Magnetic resonance imaging results showed that the patients had anterior dislocation of the shoulder accompanied by varying degrees of surgical neck fracture of humerus. The inclusion or exclusion criteria referred to this reference . This research was approved by the Ethical Committee of Department of Physical Education, Shaanxi Institute of International Trade and Commerce according to the declaration of Helsinki promulgated in 1964 as amended in 1996, the approval number is 2012002. All patients with anterior dislocation of the shoulder and surgical neck fracture of humerus included in this clinical study were treated with open reduction surgery. The specific method of open reduction surgery is: patients took supine position in the treatment for local anesthesia . After anesthesia came into effect, make a 5 cm to 12 cm incision in the anterolateral side of the affected shoulder, and sever the deltoid muscle at the attachment point of acromion and clavicle to fully expose the patient's shoulder (Figure 2). Figure 2: Schematic diagram of shoulder position. Then, the dislocated humeral head and glenoid cavity had anatomical reduction, with lacerated end of the fracture cleaned up. After the lacerated end of fracture was completely reset, T-type plate or Link anatomical plate was used to fix the fracture site of the patient. In this clinical study, 680 patients were fixed with T-type plate (smith nephew, London, Britain), 290 patients were fixed with Link structure plate (smith nephew, London, Britain) . And then normal saline was used to repeatedly wash the fracture part. Finally, repair the joint capsule and deltoid muscle, prevent and treat drainage tube, and then suture the wound. After surgery, the fracture part of the patient was fixed with bandage. Two days after the operation, the patient was instructed to have isometric contraction exercise of the shoulder muscles and active stretching exercises of the elbows. One week after the surgery, the clinician should instruct the patient to undergo passive shoulder contraction exercises. Six weeks after the surgery, the patient was instructed to undergo shoulder abduction and flexion exercises. The patient was instructed to perform routine shoulder exercises 12 weeks after the surgery. The stitches were removed from the patient 12 days after the surgery and the shoulder plate was removed from the patient after 1 year of operation. In the clinical research analysis, the clinical treatment effect of patients with joint anterior dislocation combined with surgical neck fracture of humerus is divided into three levels, namely, excellent, good and poor. Excellent: after the treatment, the patient's shoulder joint is without pain or tenderness, nor activity disorder; good: after the treatment, the patient's shoulder joint is without tenderness or spontaneous pain, but will have obvious discomfort in case of weather change or overstrain, with limited shoulder joint activity; poor: after the treatment, the patient's shoulder joint is with spontaneous analgesia and activity-limited symptoms . These two symptoms will be obviously aggravated in case of weather changes or overstrain. Excellent rate=(excellent+good)/total number of cases*100.00%. In the analysis of the controlled trial, statistical analysis software SPSS19.0 was used for analysis and processing of all the data generated. The measurement data were expressed as the mean ± average number (x̅ ± s), with chi-square for comparison between the groups. The count data were expressed as natural number (n) and percentage (%), with t for comparison between the groups. In the statistical analysis, 0.05 was used as the test standard, with confidence interval at 95%. When P<0.05, there is significant difference between the two groups, which is statistically significant. All the 2000 patients included in this clinical research analysis were treated with open reduction surgery, all receiving successful results. The healing time of the fracture end was 6 weeks to 10 weeks, with average healing time at (8.04 ± 0.15) weeks. The patients were followed up for two years after the operation. Seen from the follow-up results of the 2000 patients, among the 2000 cases of badminton athletes, 1700 cases have excellent shoulder joint function recovery, 250 cases have good recovery, the remaining 50 cases have poor recovery, with excellent rate at 97.50%. Of these 2000 patients, 36 patients had complications of humeral head ischemia and necrosis after surgery, only 10 patients had infection complications, and 45 patients had shoulder stiffness complications. Among them, symptoms of 90 patients with complications disappeared after associated treatment, with the patients cured. The average healing time at (8.04 ± 0.15) weeks. 1700 cases have excellent shoulder joint function recovery, 250 cases have good recovery, while the remaining 50 cases have poor recovery, with excellent rate at 97.50%. Clinical studies have shown that anterior dislocation of the shoulder combined with surgical neck fracture of humerus will cause very serious shoulder soft tissue injury, so that patients show varying degrees of shoulder joint activity disorder in the daily life and training process. If patients with anterior dislocation of the shoulder combined with surgical neck fracture of humerus fail to receive timely treatment, in less serious case, there will be shoulder activity disorder, in severe case, life-long disabilities may be caused, affecting life-long life quality of patients [15-16]. Recent study has demonstrated that anatomic fracture reduction with a locked plate significantly improved functional outcomes and lowered the complication rate of unstable and displaced proximal humeral fractures involving the anatomic neck . At present, open reduction is the main method for the treatment of anterior dislocation of shoulder combined with fracture of surgical neck of humerus. Therefore, clinical researchers should choose the appropriate treatment for patients, actively carry out follow-up treatment to improve the clinical treatment efficiency and life quality of patients after surgery. Seen from the statistical data of this clinical research analysis, treatment of anterior dislocation of the shoulder combined with surgical neck fracture of humerus with open reduction surgery enjoys very significant curative effect. After the open reduction surgery, the patients had good shoulder joint recovery, with low probability of complications. Thus, this surgical method can serve as preferred treatment for the patients with anterior dislocation of the shoulder combined with surgical neck fracture of humerus. It is worth noting that, after surgery, patients should actively cooperate with rehabilitation therapy to actively prevent the occurrence of a variety of complications. Only in this way can they achieve the best treatment effect, so that patients’ quality of life can be guaranteed . The long-term treatment effect is better, less postoperative complications. It is believed that in the future development, treatment regimen for anterior dislocation of the shoulder combined with surgical neck fracture of humerus will be more scientific and rational, benefiting more patients with such diseases . Lin T, Xiao B, Ma X, Fu D, Yang S. Minimally invasive plate osteosynthesis with a locking compression plate is superior to open reduction and internal fixation in the management of the proximal humerus fractures. BMC Musculoskelet Disord 2014; 15: 206. Acklin YP, Jenni R, Walliser M, Sommer C. Minimal invasive PHILOS (R)-Plate osteosynthesis in proximal humeral fractures. Eur J Trauma Emerg Surg 2009; 35: 35-39. Helmy N, Hintermann B. New trends in the treatment of proximal humerus fractures. Clin Orthop Relat Res 2006; 442: 100-108. Kannus P, Palvanen M, Niemi S, Sievänen H, Parkkari J. Rate of proximal humeral fractures in older Finnish women between 1970 and 2007. Bone 2009; 44: 656-659. Neer CS. Four-segment classification of proximal humeral fractures: purpose and reliable use. J Shoulder Elbow Surg 2002; 11: 389-400. Miiller ME, Allgower M, Schneider R. Manual of internal fixation. Springer, Berlin, 1990. Ruch DS, Glisson RR, Marr AW, Russell GB, Nunley JA. Fixation of three-part proximal humeral fractures: a biomechanical evaluation. J Orthop Trauma 2000; 14: 36-40. Xuhui L. Observation on curative effect of open reduction surgery for anterior dislocation of the shoulder combined with surgical neck fracture of humerus. Contemp Med Forum 2014; 15: 223-224. Xuguang Z, Ligeng L, Junsheng L, Lifeng Z, Zhigang A. Application of absorbable screw plus absorbable tension band and locking plate in fracture. Chinese J Tissue Eng Res 2012; 48: 8968-8975. Zhiyong Y, Long B, Jun Y, Keming C, Dazhou L, Longbo L. Comparison of curative effect of locking plate and interlocking intramedullary nailing for surgical neck fracture of humerus. Chinese J Bone Joint Injury 2016; 3: 260-262. Padegimas EM, Zmistowski B, Lawrence C, Palmquist A, Nicholson TA, Namdari S5. Defining optimal calcar screw positioning in proximal humerus fracture fixation. J Shoulder Elbow Surg 2017; 26: 1931-1937. Junhong L. Treatment of dislocation of the elderly shoulder combined with surgical neck fracture of humerus with tip layering. J Traditional Chinese Orthopedics Traumatol 2016; 06: 31-32. Sheng S. Curative effect of locking plate and interlocking intramedullary nailing for elderly surgical neck fracture of two-part proximal humerus. Dalian Med University 2012. Karaman A. A Case of accelerated pulmonary silicosis with metastatic Echinococcus alveolaris of the lungs and brain. Acta Medica Mediterranea 2015; 31: 39-41. Palumbo VD. A misunderstood intestinal perforation believed acute pancreatitis: A case report. Acta Medica Mediterranea 2015; 31: 437-441. Wang C. A direct assessment method for structure strength of icebreaker based on numerical simulation. J Coastal Res 2015; 73: 548-553. Schnetzke M, Bockmeyer J, Porschke F, Studier-Fischer S, Grützner P-A, Guehring T. Quality of reduction influences outcome after locked-plate fixation of proximal humeral type-C fractures. J Bone Joint Surg Am 2016; 98: 1777-1785. Shu F. A double-population genetic algorithm for asc loading sequence optimization in automated container terminals. J Coastal Res 2015; 73: 64-70. Aldahlawi AM. Analysis of CD95 and CCR7 expression on circulating CD4 (+) lymphocytes revealed disparate immunoregulatory potentials in systemic lupus erythematosus. Saudi J Biol Sci 2016; 23: 101-107.